This entry was posted in beast, shotgun, weapon and tagged 410, horse, revolver, rider, saddle. Bookmark the permalink. I think this is one of those devices that the bad guys call an “assault weapon”. Hehe, yep a shotgun with a revolving cylinder makes it a “street sweeper”, don’t you know. 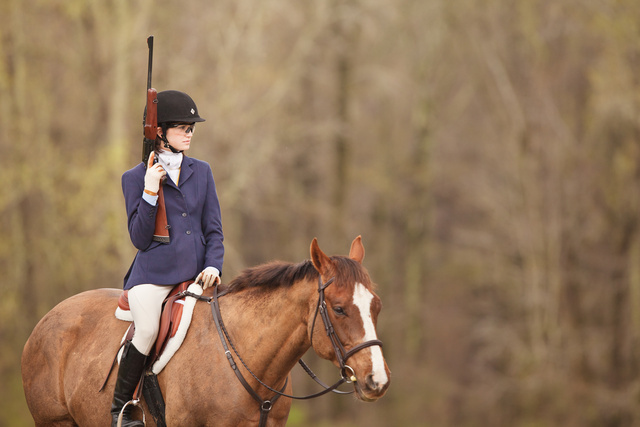 She needs either a sling on the shotgun or a shotgun boot on the saddle. Otherwise another beautiful image up to your usual standards. So the revolver-action long gun is making a comeback in shotguns. The Technical Specs leave me scratching my head, though. 10+1 Capacity but Action = Single shot, 12 grooves but a full choke? Our local gun store has a replica revolving carbine in .45 LC. It’s high on my “if I could afford one of everything” list. Tech specs were obviously copy-pasted with no attention to detail whatsoever. It holds five rounds. What are the ballistic characteristics of the .45 LC in this barrel length? It would seem that the barrel is about 6 inches too long. 16 inches seems to be the sweet spot for the .45 LC ammo. I have to admit I want one because it is a revolver shotgun. Who wouldn’t want one?